Yes, I am a Canon EOS fan. Not because I don’t like Nikon or Pentax (I’ve always even had some kind of special fondness for the Pentax philospohy) or Olympus, but because the EOS 350D was the best affordable DSLR when I wanted to buy one some years ago. And then I stayed with Canon. My next cam was the 40D, later – after I had sold the 350D – the 5D as a fullframe camera (Yeah, finally 24×36 again!) and even a “manual focus” (broken AF) 300D arrived at my place. But one day I started to be interested in the Foveon technology and if it really was that much better than the Bayer matrix. So I got a Polaroid x530, the only really “cheap” Foveon cam. I like the way it looks and I like the results at low ISO settings, but it is pretty slow, so I did not use it often. 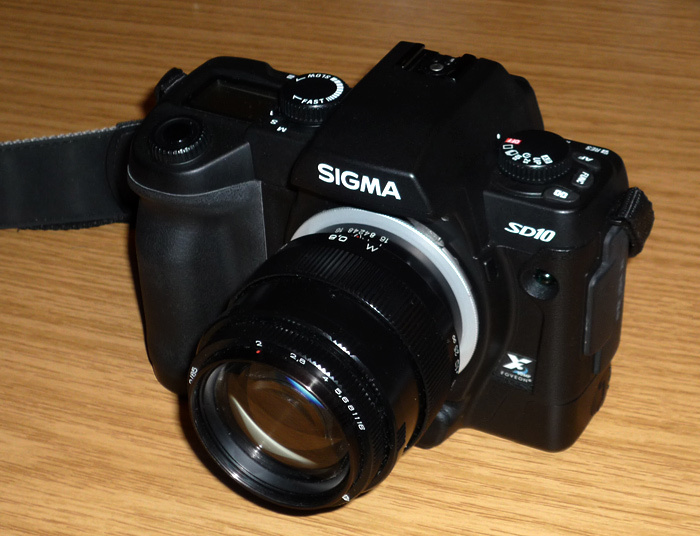 Well, as it sometimes happens, I got the chance to get hold of a mint Sigma SD10. A Spanish friend wanted to sell his copy. I did not think about it for long. We quickly had a deal. And now I am the proud owner of my fourth (actually, fifth) DSLR. Gosh, that’s kind of decadent, isn’t it? Since I do not own any Sigma SA/SD lenses, I only can use my M42-lenses on this cam. But I do like to take photos with manual lenses anyway and I do have several very nice M42-lenses, so that is not really a problem. What do others think about the SD10? What do I think about the Sigma?